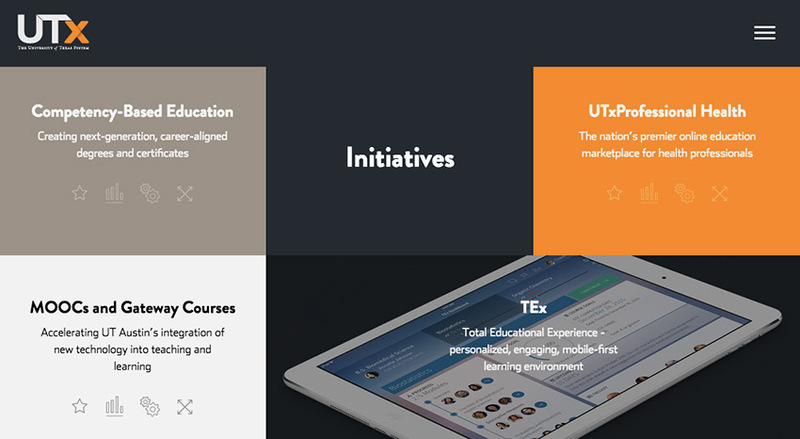 Kiosk is a big proponent of education innovation, and no initiative may be bigger than the University of Texas System and their Institute for Transformational Learning. Their mission is to leverage new technology to develop best-in-class learning models that will transform education. The entity, called UTx, was creatively branded by Kiosk. Working with UT campus partners, UTx is designing and building personalized, industry-aligned and data-driven educational models. The new models that prove most effective will be scaled for greater, far-reaching success for the people of Texas and beyond. The measure of success is optimizing time-to-graduation, raising graduation rates and boosting professional advancement in the workforce. At Kiosk, we serve as a marketing force for the advancement of education, and we work with our higher education clients to help bring life-changing opportunities to learners of all ages. We just completed a dynamic, mobile-friendly website for UTx. The launch of the UTx site coincided with SXSWedu – the four-day festival and conference that fosters innovation in learning. Please check out our work by viewing the UTx website.